Canada Blooms is excited to announce that it has chosen for its flower of the year the new Canadian Shield™ rose. The Canadian Shield™ rose has been selected from the Vineland Research & Innovation (Vineland) rose breeding program. This new variety of rose, branded and marketed by Vineland will make its debut in gardens next summer in time for Canada’s 150th birthday celebration. It’s the first rose in a curated collection to be released in the coming years and known as Vineland’s 49th Parallel Collection. In keeping with Canada's celebration, the Toronto Flower Show and Canada Blooms present "Oh! Canada" March 10-19, 2017 at the Enercare Centre in Toronto. The Toronto Flower Show is a breath-taking display and competition for amateur floral arrangers and garden club members. Each year the Toronto Flower Show competition showcases the talents of the horticulturalists and designers from the Garden Club of Toronto. In addition, non-professional exhibitors and members of Horticultural Societies or Garden Clubs are welcome to enter the "Open" classes to compete in Horticultural Special Exhibits, Floral Design, Photography and there is even a Youth Category. All Toronto Flower Show entrants are invited to the Awards Ceremony on the Unilock Celebrity Stage, Sunday, March 19, 2017 at 3:30pm. 1. "Who can enter items in the Toronto Flower Show?" Any non-professional can enter items in the Open Classes. Non-open Classes are only available to the members of, or by invitation only by, the Toronto Garden Club. An Open Class is just that: open for entry by any non-professional who has grown, photographed or designed/created an item that meets the class description. The item must be the work of the person entering it. It is not acceptable to enter a gift you received or a purchased item. The classes that are open to any individual are: many Horticulture classes, some special exhibit classes in Horticulture, three Open classes in Floral design, and all classes in Photography and Youth. The Garden Club of Toronto does not charge an entrance fee to enter. The schedule can be found online on the Canada Blooms and Garden Club of Toronto websites. You can then complete the online form or download the pdf version and return it to the Convenor by mail to: The Garden Club of Toronto, 777 Lawrence Ave. E., Toronto, ON M9C 1P2, by email to: cbentries@hotmail.com, or by fax: 416-477-1567. Have you ever wondered why the Poppy is the symbol of rememberance for veterans?Scarlet corn poppies (popaver rhoeas) grow naturally in conditions of disturbed earth throughout Western Europe. The destruction brought by the Napoleonic wars of the early 19th Century transformed bare land into fields of blood red poppies, growing around the bodies of the fallen soldiers. So please take a moment to purchase a poppy from a veteran for Remembrance Day and thank them for their service. 2017 is the 150th birthday of Canada. You can give a gift to our country that will INSPIRE Canadians to come together in a historic effort to honour our war dead. With your help, we will create the Highway of Heroes Living Tribute: a living, breathing memorial for the Canadians in our families and communities who have given their lives. We have begun planting 117,000 trees, one for each Canadian that has fallen since Confederation. 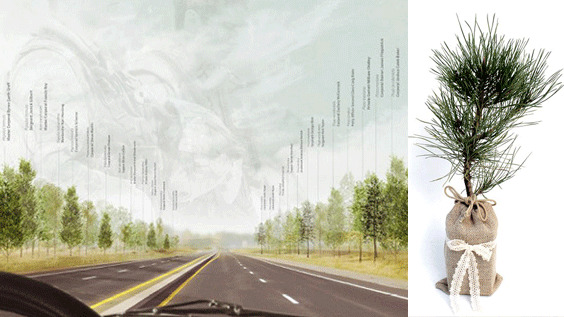 Become a Champion by making a $150 donation to buy a “Hero Tree,” one of the 117,000 that will be planted along the Highway of Heroes. For every $150 donation, you will receive a "150Tree Kit" that includes a small '150Tree', a HOHLT t-shirt and an official certificate to commemorate your gift to Canada. Certificates will be delivered upon donation and your t-shirt and ‘150Tree’ will arrive in the spring, for you to plant in the location that means the most to you! Inspire others to do the same and join you in becoming a Champion. Take a picture, make a short video help make this go viral! On social media, share the news of where YOU will be planting YOUR '150Tree' and WHY using the hashtag #150Tree. You can be one of the catalysts behind this national movement that elegantly combines environmental preservation and supports our troops. It is an opportunity for Canadians to unite behind this unique Tribute. Join us and become a Highway of Heroes Living Tribute Champion today. As we move into the holiday season there is nothing that brings joy and colour like plants and flowers. When people think Christmas they tend to think of the following Christmas Cactus, Holly, Mistletoe, Rosemary, of course Poinsettia. But more recently the Amaryllis has started to become the holiday plant of choice. The Amaryllis is one of the easiest bulbs to grow and bloom. And their plump blooms atop long stems can add some brightness in the dull winter. There are a wide variety of colours available and they make a great holiday gift that you can enjoy throughout the year. • Place in a bright, warm location indoors. Avoid direct sunlight. • Keep temperature Moderate, 60-70 degrees. • Keep the soil moist. Don't over water, and avoid getting water inside the neck of the bulb. • Use an all-purpose house plant liquid food, once a month. • As the stems grow tall and bloom, the container or terrarium should be turned slightly every day to prevent the Amaryllis from leaning. • After the plant has flowered and when the foliage has yellowed, cut it off just above the top of the bulb. Leave the pot dry for about 3 months then begin watering again. Take note that some plants may be toxic when ingested. Keep plants out of reach of pets and children. Unilock’s versatile palette of colours, textures and European-inspired style can help you create your own one-of-a-kind space. Whether you love the look of quarried stone, timeworn cobblestone, historic brick street pavers or sleek modern aesthetics, Unilock has a range of products to offer. In 2017, Unilock is launching a NEW retaining wall called ArchiTEXTURES™. Contemporary and sleek lines with a linear multi-length plank look. Ideal for garden walls, pillars and other outdoor vertical elements. ArchiTEXTURES™ Wall offers up modern design and exceptional flexibility. For over 40 years Unilock has been committed to investing in the future of landscape design. Today, we continue to lead the industry with the best selection of quality products and support. We believe that the outside of your home should be as beautiful, functional and welcoming as the inside of your home. After all, your home is where family and friends connect with one another. Unilock is “Designed to Connect”. Sean James: What to do with a Downpour – Ornamental Ways to Handle Rain Water. Our cities are largely covered by impermeable surfaces – roofs, parking lots, roads, even compacted soil – which contribute to water pollution, flooding and bank erosion in urban ravines. Sean James will demonstrate how gardeners can help turn the tide on this troubling situation with beautiful water-protecting landscapes. Date: Monday, November 21, 7:30 p.m. Bistro opens 5:30 p.m. Doors open 6:30 p.m. Lecture: 7:30 p.m. The Seasons Christmas Show takes place November 18-20 at the International Centre, Mississauga. Shop for all of your holiday needs, with over 300 exhibitors featuring unique gifts, entertaining ideas, luxurious decor and gourmet treats! New this year, the Makeful Market will feature over 50 vendors featuring Canadian, handmade, one-of-a-kind items for that hard to shop for person on your list. Get inspired and attend one of the many free seminars and workshops at the show, all weekend long. Get Your Tickets for the 2017 GTA Home & Reno Show! Looking to scratch a few things off your to-do list, update the kitchen perhaps? At the GTA Home & Reno Show you’ll find the GTA’s top contractors and suppliers, celebrity experts, hands-on learning, and local designers, all ready to help with your next project. All the advice and inspiration you need is waiting for you February 17 – 20, 2017 at the Show. Visit the GTA Home & Reno Show for innovative products from 300+ vendors. Special to Canada Blooms subscribers: Save $4 off the General Adult Admission entrance fee, with the promo code: Blooms. Get your tickets today and save. Royal Botanical Garden Train Show is part of the Holiday Traditions event running from November 19 to January 9. The Royal Botanical Gardens will be celebrating Holiday Traditions from November 19 to January 9th. Join them as they celebrate the wonder of the season, take in the splendor of the flowers and enjoy the Train Show daily. The RBG Train Show features numerous Canadian landmarks constructed from over seven tons of cedar slabs, 3,000 pounds of rock and 250 feet of track. You’ll find Canadian landmarks in RBG Centre and depictions of Wonders of the World in the Mediterranean Garden.